This was the promised unlockable feature of Level 3 and it should be available in a few days. We will blog about this as soon as its done. This is something we silently released last week. The 'Pro Preview’ is well the preview of the Pro version of the DripStat APM and its free and the available for all for now. In fact, your current APM tab is using the Pro Preview version right now. When we start charging for the Pro version, the free version will contain the features you unlock from the game. But for now, everyone gets to use the Pro version. Note that the game will remain free forever, of course. This is one of the features of the Pro version. If you look at your JVMs right now, you will be able to select any time range at all and see full data for it. We will be adding new features to the Pro Preview version every few days so expect a lot more visibility inside your JVMs! We have reset the scores and added a new widget, but we will continue adding features progressively to this level. This is available now. The new Dripped JVMs widget shows you all your JVMs connected to DripStat and their dripping activity in the game. 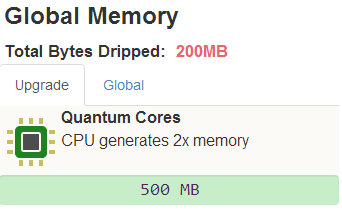 Note: No, we do not actually use your jvm’s memory in any way for the game. 1. Have more upgrades to buy that do more varied things. 2. The goal of a full level is usually pretty large, eg - 4 Petabytes for Level 4. Since that can take many weeks to reach, we want to have smaller intermediary goals in the game. Community Locked Upgrades are just that. These are upgrades that will be unlocked when the global drip score reaches a certain amount. Only when they are unlocked by the community will they be available for purchase in the Powerup Store. Yes, we know you want to see more the leaderboard and we will allow you to do exactly that. We have been mulling over this. We want to make sure this is right before we release it. By right I mean being able to control the social aspects of this to ensure that this doesn’t just become a ground for people to throw curses at each other.